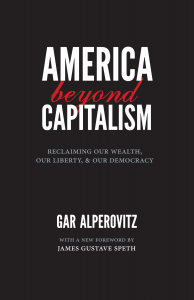 Gar Alperovitz has been thinking and writing about the design of alternative political and economic systems for much of his distinguished career. As an undergraduate at the University of Wisconsin he studied history in classes led by William Appleman Williams, one of the leading modern historians (and whose arguments about scale and regionalism are echoed in certain aspects of the Pluralist Commonwealth model). As a Marshall Scholar and Fellow of King’s College at Cambridge University in England, Alperovitz studied under British economist Joan Robinson and such intellectual luminaries as Pierro Sraffa, Nicholas Kaldor, Richard Kahn, E.H. Carr, and Sir Denis Brogan. 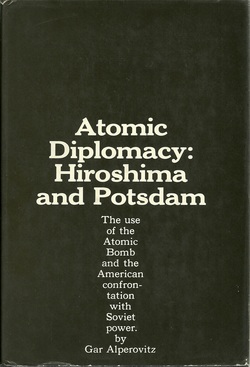 His PhD thesis, published by Simon & Schuster in 1965 as Atomic Diplomacy: Hiroshima and Potsdam: The Use of the Atomic Bomb and the American Confrontation with Soviet Power, famously opened the modern national debate on the geopolitics of America’s decision to use of the atomic bomb in 1945. Gar Alperovitz's involvement with the Gulf of Tonkin resolution was discussed in David Halberstam's best-selling book "The Best and the Brightest." A period of work in politics—as a legislative director in both the U.S. House of Representatives and the U.S. Senate, and as a high level Special Assistant in the U.S. State Department—served to confirm Alperovitz’s growing conviction concerning the mismatch between cherished American values and the political and economic institutions of both U.S. capitalism and traditional state socialism. Working with Senator Gaylord Nelson of Wisconsin, the founder of Earth Day, he also began to think more deeply about environmental issues as well as the pressing problems of militarism and imperialism involved in the escalating Vietnam War. He was the principal legislative architect behind proposals that created several regional commissions (the so-called "Title V Commissions") during the Johnson Administration, a decentralist theme he continued to pursue in subsequent and ongoing work. In 1964 he drafted an amendment submitted by Senator Nelson that would have limited the scope of the infamous Gulf of Tonkin resolution. The passage of that resolution proved a turning point in the Johnson Administration’s increasing involvement in Vietnam and Alperovitz left government as the war escalated. While working in the Senate, Alperovitz also participated in efforts to support the growing civil rights movement, initially at the 1964 Democratic Convention in Atlantic City, where he first met Dr. Martin Luther King, Jr. and legendary civil rights leader Bob Moses. (After the Atlantic City Convention, as a Senate aide, he toured Mississippi with Moses). 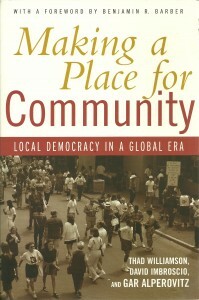 Such experiences contributed to Alperovitz’s conviction that new approaches to community economic development were necessary—approaches based on changing and democratizing ownership paradigms. In 1967 he met again with Dr. King (and his aides Andrew Young and Bernard Lee) to begin to sketch out possible strategies that could go beyond anti-poverty and job training programs towards building new community-wide economic institutions that might also begin to build political power. Subsequently he co-authored the Community Self-Determination Act of 1968, sponsored by 26 Senators, which introduced an expansive ownership-oriented conception of the then more narrowly conceived Community Development Corporations (CDC) as a new institutional form. 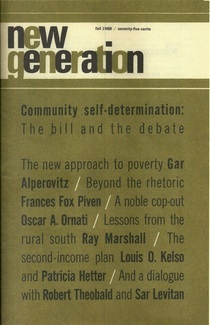 Gar Alperovitz's 1968 article "The New Approach to Poverty" as well as his remarks to the Community Self-Determination Symposium situates the Community Self-Determination Act and the genesis of the community development corporation in the context of the fight against poverty. Alperovitz was the key organizer behind Vietnam Summer. 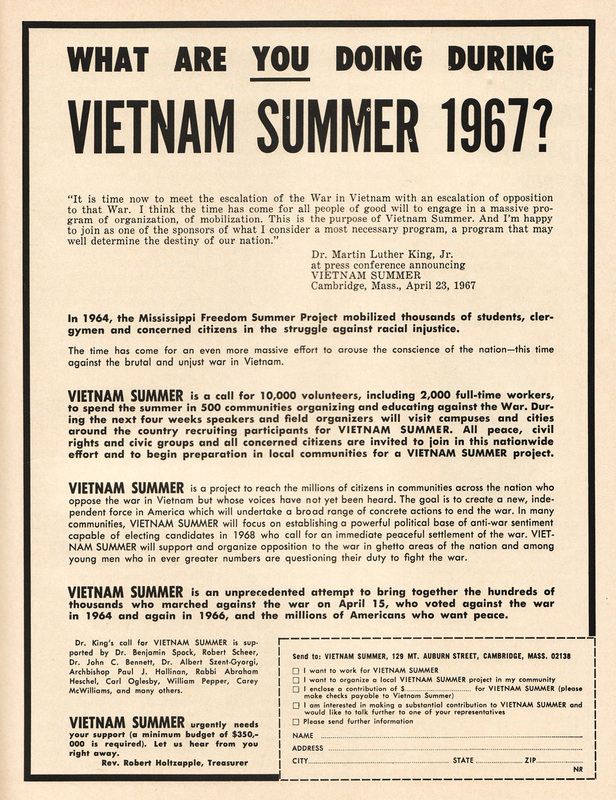 Alperovitz was also a leading force behind the large-scale 1967 Vietnam Summer organizing effort—kicked off at an event chaired by Alperovitz and featuring Dr. King and Benjamin Spock. During this period he was based at Harvard as a founding Fellow of the then newly-formed Institute of Politics. Subsequently he launched the first of what was to become a series of related think tanks dedicated to the exploration of economic alternatives. In 1968 he co-founded The Cambridge Institute with Harvard sociologist Christopher Jencks, and also became President of the Center for Community Economic Development shortly thereafter. Numerous books and reports on various elements related to the Pluralist Commonwealth model were published during these early years—notably, one of the earliest modern collections on approaches to worker-self managed firms, and on regional constitutional restructuring. Subsequently a sister institution, The National Center for Economic Alternatives, was created to pursue much greater in-depth research on related questions. (In 1983 this became the National Center for Economic and Security Alternatives). At the Center he developed approaches to various forms of democratic ownership—including detailed planning for joint community-worker ownership of a large steel mill in Youngstown, Ohio. Additional work on sectoral and other forms of planning (particularly related to the ‘basic necessities’ of food, housing, health and energy needs) was also a major focus of Center research. Substantive work conducted at these institutions was transferred to The Democracy Collaborative at the University of Maryland when Alperovitz became a Professor there in 1996. Working Papers For a New Society was an influential publication of the Cambridge Institute. 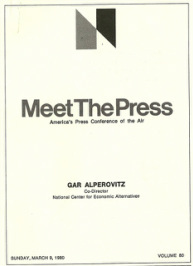 Alperovitz appeared on Meet the Press in 1980 to discuss the problems of inflation. In 1979 he was profiled in People Magazine and The New York Times. During these years, related public and other events also helped stimulate discussion of key issues that emerged from the research. 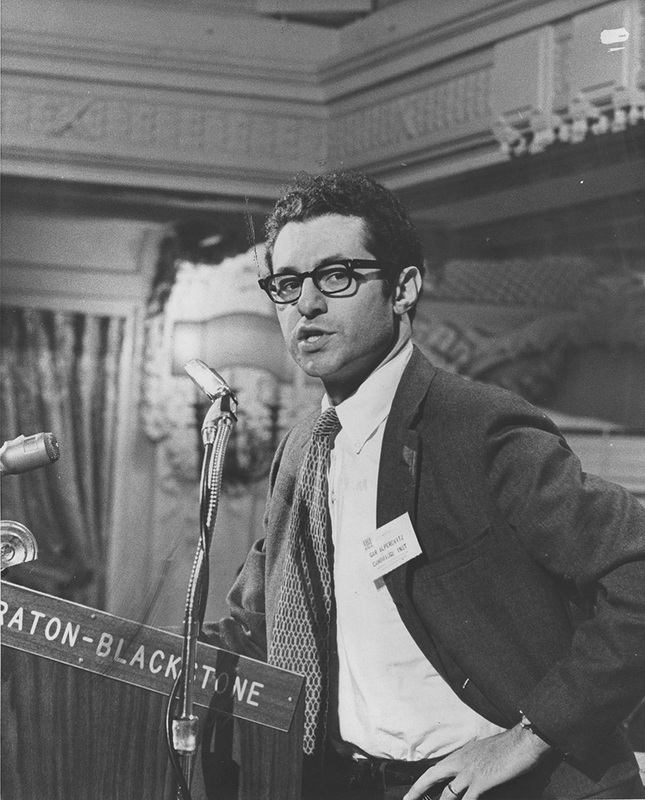 In 1977, for instance, a public campaign by leading progressives (including a group of 60 senators and representatives, led by luminaries Edward Kennedy and Hubert Humphrey), labor leaders, citizens’ groups, and environmental organizations attempted to secure Alperovitz’s nomination by the newly-elected Carter Administration to the Council of Economic Advisors. Although the Carter Administration rejected the proposal, in the early 1980s Alperovitz returned to government as Senior Economic Policy Adviser for the National Economic Recovery Project (with 154 members of the U.S. House of Representatives). During this period he was one of the nation's leading authorities on the problems of unemployment and inflation arising in key sectoral changes. Alperovitz was also heavily involved in the 1977 fight against the shutdown of Youngstown Sheet & Tube (a large Ohio steel mill that had closed its doors and laid off 5,000 workers. 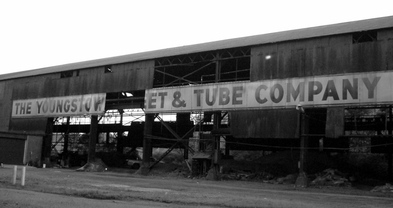 This led to ambitious efforts by steelworkers and a broad-based community coalition to reopen the steel mill under worker-community ownership. Alperovitz was the chief economic adviser to the effort and an adviser also to a broad national coalition in support of it. 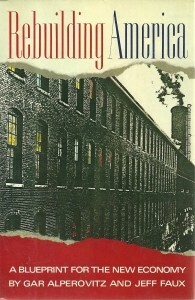 With Carter Administration help a sophisticated plan to reopen the mill under worker-community ownership was developed and—though ultimately scuttled by political opposition—the effort stimulated the expansion of other on-the-ground experiments involving alternate democratic ownership forms in Ohio and elsewhere around the nation. 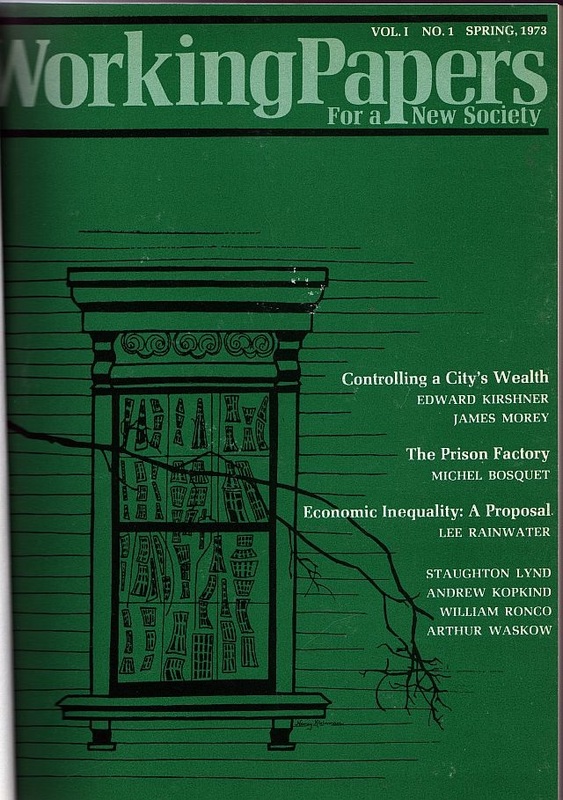 The April 1978 issue of Mother Jones had an extensive article on the fight for worker-ownership in Youngstown and a long profile of Gar Alperovitz by Ron Chernow. An early programmatic sketch of the model's basic principles can be found in the 1973 essay, "Notes Toward a Pluralist Commonwealth." 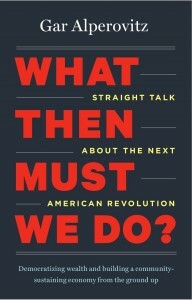 The most recent book to explore the Pluralist Commonwealth model is 2013's What Then Must We Do? 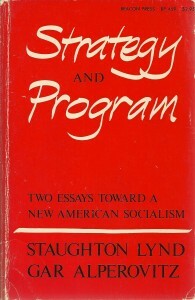 Alperovitz’s earliest sketch of his alternative political-economic system model, the Pluralist Commonwealth, was published both as an article and then together with an essay by Staughton Lynd as Strategy and Program in 1973. 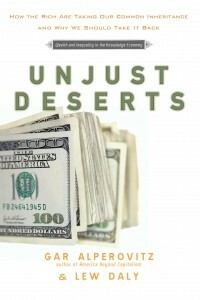 The themes were continued in Rebuilding America , published by Alperovitz and Faux in 1984, and more recently and in fuller form in Making A Place of Community (with Thad Williamson and David Imbroscio), America Beyond Capitalism, Unjust Deserts (with Lew Daly), and What Then Must We Do? Numerous articles appeared regularly in such publications as The New York Times and The Washington Post as well as progressive journals ranging from The Nation to Sojourners and Dissent. Other related studies supervised or co-authored by Alperovitz include Building Wealth (The Democracy Collaborative, 2005); and Climate Change, Community Stability, and the Next 150 Million Americans (with Thad Williamson and Steve Dubb, 2010). Alperovitz has also continued work on the atomic bomb and atomic diplomacy. Building on his earlier study, on the 50th anniversary of the bombing of Hiroshima in 1995 he published an extensive landmark work, The Decision to Use the Atomic Bomb and the Architecture of an American Myth, which both generated intense national and international debate and garnered high praise in such publications as the prestigious American Historical Review. Alperovitz has also been a Guest Scholar at the Brookings Institute, one of the founders of the Institute for Policy Studies, a founding Board member of Yes! Magazine, and a member of the Board of the New Economics Coalition. The Democracy Collaborative, of which Alperovitz was a founder with Ted Howard, is today the leading research institution focused on community wealth building in the United States and maintains the website Community-Wealth.org. Many of Alperovitz’s ideas have also found life in recent practical work on the ‘Cleveland Model’ by the Democracy Collaborative. 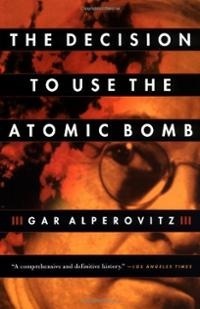 Read more of Gar Alperovitz's work on the atomic bomb and the cold war.